Golfzon has a mission to make golf more enjoyable for everyone. Whilst they originally targeted the swing analyzer segment (Swingtalk analyzer), they have now become a huge player in the ‘screen golf’ industry recording sales of $350 million in 2014. Screen golf has made a huge impact on the game particularly in Asia where there are over 50 million people who use indoor screens regularly. Golfzon provide the opportunity to still play golf indoors if there’s inclement weather or if a regular golf course is too expensive or if golfers simply don’t have 5 hours for a round of golf. They’ve also now branched into other areas within the golf tech space offering younger people something more appealing when taking up the game of golf. Golfzon launched its newest project recently – a golf course application with over 60,000 golf courses in its database. That represents a whopping 90% of courses across the world, including Korea and the United States. The two options are a ‘Smart Caddie’ and ‘Golf GPS’ which provide an array of functions, but obviously the most important being measuring distance. Both of these provide a full range of courses and obstructions, shot tracking and driving distance as well as helping approach a hole based on previous shot history. Not to mention high resolution graphics. Golfzon have initially designed it to be paired up with Samsung S2 and S3 smartwatches, but plans on offering an iOS option early 2019. To add to the stable of new products Golfzon also offer a Smart Marker, which connects to a smartphone app and provides audio feedback on distances as well as shot tracker that records detail to your phone application. Another product is the basic Golf Scorecard which is an application that allows you to upload your scorecard photos to one of the courses on the database and it will automatically digitize the scores into the system and save for your records. This is handy though for the regular golfer to keep track of certain statistics (for those stats junkies!). One of Golfzon’s most unique and successful products though is the Swingtalk Swing Analyzer. 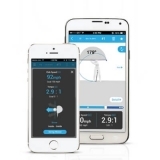 The biggest selling point about the Swingtalk is that it actually speaks to you after each and every shot providing critical feedback to improve on your next shot. They do stick to five particular swing aspects which makes things easier and simpler in order to not confuse the higher handicapper in particular. The last product in the Golfzon contingent is the CaddyTalk Laser Rangefinder and carries all the usual functions and benefits of a regular rangefinder. One thing it offers which is exceptionally unique is a green slope measurement aiding in determining the amount of break for a particular putt. Golfzon is providing fresh ideas and developing new niche technologies for the golf industry and golfers all over the world. Whilst their products may possibly slow the game down a touch on an actual golf course, they certainly make it just that little bit more fun in the process.